This latest recipe came out of the May 2015 issue of Cooking Light magazine. The actual recipe calls for broccoli rabe which I could not find in my supermarket so I substituted broccolini. If you're interested in knowing the difference, look here. I love making pork medallions because they are so easy to prepare, always stay juicy, and offer a great lean protein alternative (enough chicken already!). The whole family is fond of any roasted vegetable, making this meal a home run. Arrange broccolini in a single layer on a jelly-roll or rimmed baking pan; coat with cooking spray. Broil 8 minutes, carefully turning after 5 minutes. Set aside and squeeze lemon juice on top. Heat a large skillet over medium-high heat. Add 1 tablespoon oil to pan; swirl to coat. Sprinkle pork with 1/2 teaspoon salt and 1/4 teaspoon pepper. Add pork to pan; cook 4 minutes on each side or until desired degree of doneness. Remove pork from pan. Remove pan from heat. Add reamaning 1 tablespoon oil, remaining 1/4 teaspoon salt, remaining 1/4 teaspoon pepper, and vinegar to pan, scrape pan with a wooden spatula to loosen browned bits. 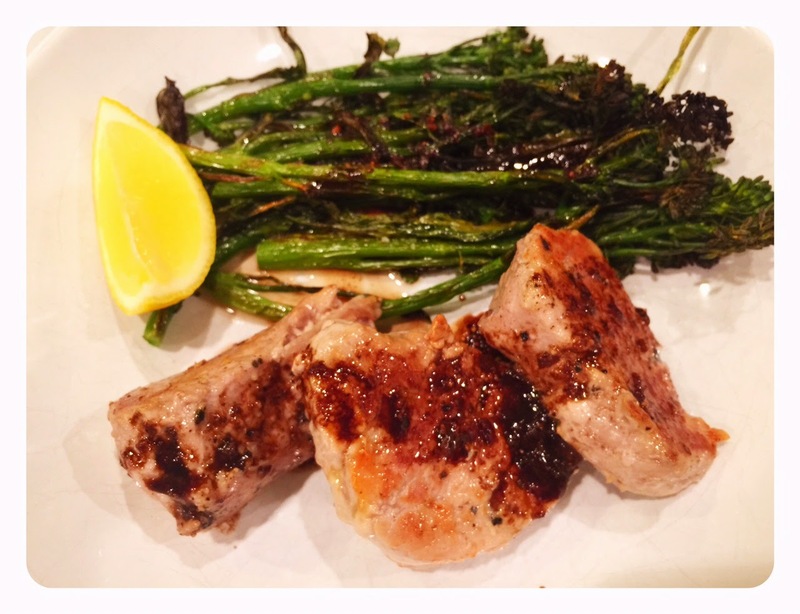 Drizzle sauce over pork and broccolini. Serve with optional extra lemon.